Data continues to grow at a rapid pace, filling storage space almost as fast as it is made available. Yet, the management of the tape robots, tape catalogs, DFSMSHSM, ICF catalogs, DASD volumes and more has not been greatly simplified. In many cases, the challenge of managing the vast quantity of data and storage devices has only increased in complexity. In addition, experienced storage management personnel continue to retire, leaving the less experienced to master the juggling of a menagerie of management tools, hardware, folders, files and data to meet the needs of the business. 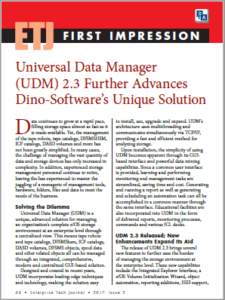 Universal Data Manager (UDM) is a unique, advanced solution for managing an organization’s complete z/OS storage environment at an enterprise level through a centralized view. This means tape robots and tape catalogs, DFSMShsm, ICF catalogs, DASD volumes, DFSMS objects, spool data and other related objects all can be managed through an integrated, comprehensive, modern and centralized GUI-based solution. Designed and created in recent years, UDM incorporates leading-edge techniques and technology, making the solution easy to install, use, upgrade and expand. UDM’s architecture uses multithreading and communicates simultaneously via TCP/IP, providing a fast and efficient method for analyzing storage. Upon installation, the simplicity of using UDM becomes apparent through its GUI based interface and powerful data mining capabilities. Since a common user interface is provided, learning and performing monitoring and management tasks are streamlined, saving time and cost. Generating and running a report as well as generating and scheduling an automation task can all be accomplished in a common manner through the same interface. Educational facilities are also incorporated into UDM in the form of delivered reports, monitoring processes, commands and various JCL decks. The release of UDM 2.3 brings several new features to further ease the burden of managing the storage environment at the enterprise level. These new capabilities include the Integrated Explorer Interface, a z/OS Volume Initialization Wizard, object automation, reporting additions, JES3 support, sysplex-wide password support, message reply ID variables and automation history records. For this review, we will concentrate on the integrated explorer interface and the z/OS Volume Initialization Wizard. An Integrated Explorer Interface has been added to the UDM GUI, enabling web style navigation. Now z/OS File System (zFS) mounted files can easily be explored by drilling down in the folders and files comprising a zFS aggregate. Storage groups can now be explored by drilling down as well to easily identify the volumes and data sets aligned with each storage group. Possibly the best new addition of all is the ability to explore catalogs by drilling down to the alias and data set entries associated with the catalogs. The other important feature of UDM 2.3 is the addition of the z/OS Volume Initialization Wizard. The Volume Initialization Wizard simplifies the task of volume initialization. In addition, the Volume Initialization Wizard performs verification to ensure nothing is on the volumes, and that the volumes are offline to all systems. VOLSER names are automatically generated based on user input criteria, and the Volume Initialization Wizard ensures that source and target name conflicts do not occur. Simplify and expedite the inclusion of new systems by allowing a user to easily port storage management SLAs and processes to new z/OS systems via a single mouse click. Port changes to storage management processes to all systems in the Enterprise, also via a single mouse click, ensuring a dramatic reduction in resources needed in managing multiple systems and Sysplexes. Automate the collection of data to allow making informed decisions on when more storage is required, or better still, it can identify the wastage in an environment which if cleaned up would negate the need for further storage acquisitions. Remove the risks and consequences of errors and omissions such as out of space failures, ICF catalogs are full, failed backups, etc. Reduce software inventory. If there are individual products to report on parts of a storage subsystem or products to automatically defragment volumes or products to identify and repair errors, UDM can perform all these functions and more in a single product. Reduce the manpower needed to manage z/OS Systems. For example, using UDM, a single action could list all of a user’s data from all systems and Sysplexes, and a subsequent delete action could remove all the data in a single mouse click.